EURUSD is massively under the influence of US election. A Democrat victory in House is weighing on USD. ECB Non-Monetary Policy Meeting will be released today as well. 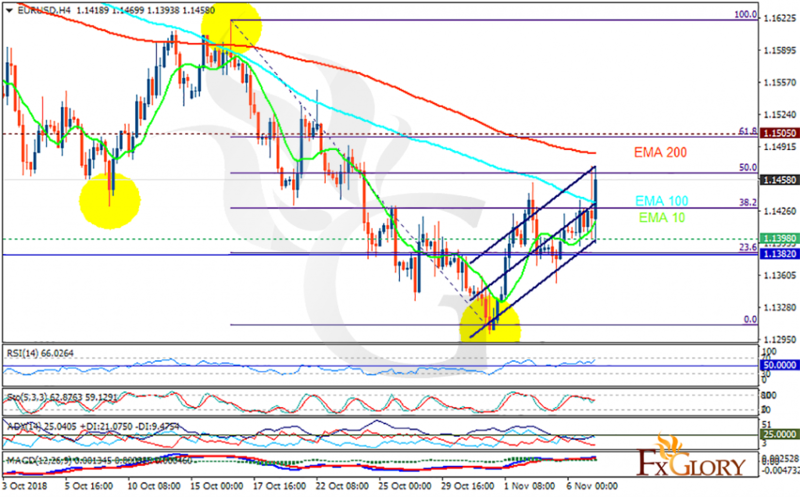 The support rests at 1.13980 with resistance at 1.15050 which both lines are above the weekly pivot point at 1.13820. The EMA of 10 is moving with bullish bias in the ascendant channel and it is below the EMA of 200 and the EMA of 100. The RSI is rising towards the overbought area, the Stochastic is moving in middle ranges and the MACD line is above the signal line in the positive territory. The ADX is showing buy signal. EURUSD will most probably grow towards 61.8 level of Fibonacci at 1.15.